All are partially printed, 8” x 12” with wax seals present, each date refers to the “Reign of Our Sovereign Lord George the Third ...”, and each signed by the Justice of the Peace, folds else VG. They include; Deed, September 19, 1766 being a land sale by Reuben Squire of Litchfield, Colony of Connecticut to James Masters, for seven pound and 12 shillings. the land deed is signed by Justice of the Peace, Elisha Stoddard ((1706 - 1766), was appointed lieutenant 1st Company Woodbury, promoted to captain during the French indian War, Justice of the Peace 1757-66. 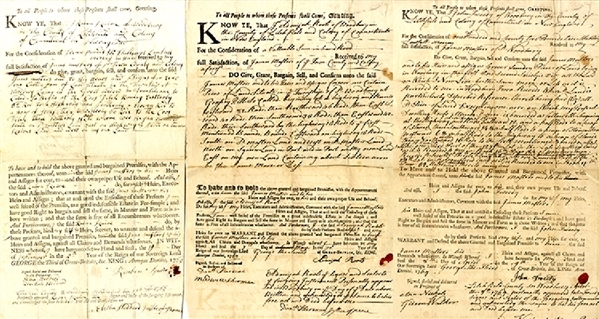 ... plus, Deed, May 7, 1769 being a land sale from Atonyak Roots of Woodbury, Colony of Connecticut to James Masters, signed by Justice of the Peace Daniel Sherman, (1726-?) was a member of the Council of Safety during the entire war and represented Woodbury in the General Assembly for fifty-nine semi-annual sessions... .plus, Deed, April 8, 1769 being a land sale from John Tweedy Woodbury, Colony of Connecticut to James Masters, signed by Justice of the Peace Gideon Walker, (1711-1781).